Born without a right arm, Jonny Cole couldn’t ride a bike. Four UI undergrads created a device that lets him ride with confidence. Born without most of his right arm, Jonny Cole couldn’t ride a bike. 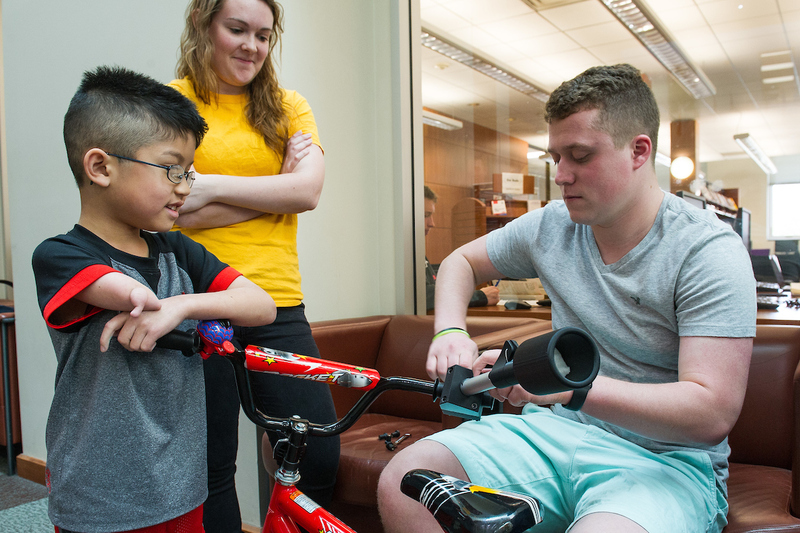 Four UI undergrads in the Department of Biomedical Engineering—Mitchell Miller (right), Kylie Hershberger (second from left), Nate Witt (not pictured), and Alicia Truka (left)—created a device that lets him ride with confidence. Photo by Kirk Murray. Eight-year-old Jonny Cole had a wish. Like most kids his age, he dreamed of riding his bike—a red motocross model with a Spiderman bell—around his Cedar Rapids, Iowa, neighborhood and on the bike path with his family. Jonny Cole smiles as he tests out the assistive device that allows him to better ride a bicycle. Alicia Truka, one of the four biomedical engineering students who designed the device, follows Jonny as he rides. Photo by Kirk Murray. But Jonny’s wish wasn’t as simple as it sounds. A congenital amputee, he was born without most of his right arm, the result of amniotic band syndrome, a rare birth defect caused when strands of tissue from the amniotic sac wrap around a baby’s finger, hand, arm, or leg, cutting off circulation and stunting development. Jonny’s father, who felt helpless watching his son try to master the bike—riding it with one hand and missing tight turns again and again—decided to find a solution. At the time, Douglas Cole was a graduate student studying linguistics at the University of Iowa, and he didn’t have to look far for an answer. From there, Cole was quickly directed to the biomedical engineering department—specifically to the experts in diagnostic and therapeutic health care device design. There, UI seniors complete a two-semester design project during their final year, and at the beginning of the year are presented with a list of possibilities. This year, one of the projects was Jonny’s. Biomedical engineering students Mitchell Miller, Kylie Hershberger, Nate Witt, and Alicia Truka jumped at the chance to work with the boy and quickly became close friends of the family. Once they’d been assigned the project—nicknamed Jonny and the Flamethrowers—the students got busy setting up meetings with Jonny and his father and commencing the design process. At one of their first meetings, as the students were trying to get an idea of what Jonny wanted his device to do and how he wanted it to look, they were surprised by his laser focus. “We were asking him all these questions and he just looked at us and said, ‘I just want to ride my bike,’” says Truka, a senior from Mason City, Iowa. Meetings with Jonny took place on Monday afternoons, a time that fit into the second-grader’s school day and his father’s academic schedule. During those meetings, a friendly bond developed between the boy and the students. Sure, they had work to do, measurements to take, and questions to ask, but there was also time for games of hide-and-seek, tag, and frequent high-fives. 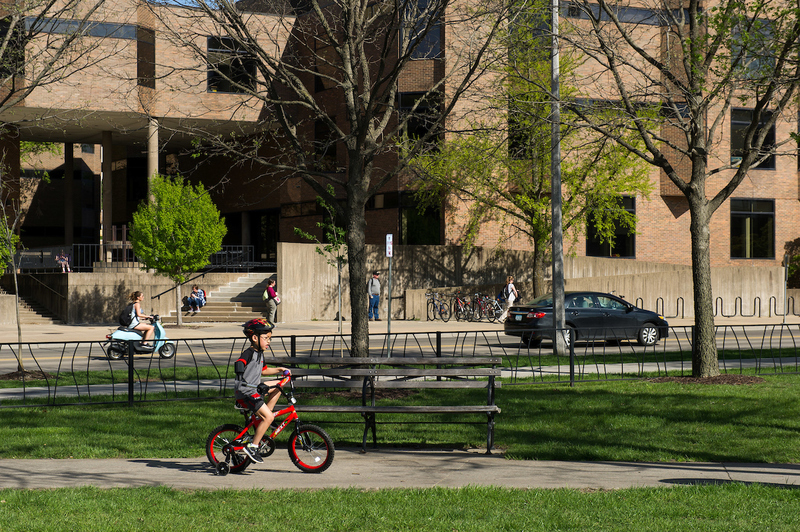 During the winter months, when freezing temperatures made it impossible to practice bike riding outside, the students brought Jonny and his red bike into the Seamans Center for the Engineering Arts and Sciences. On the center’s fourth floor, hallways became Jonny’s personal velodrome. Although some early models of the arm device broke, the students eventually found a combination of metal and plastic that was sturdy enough to hold up to the vitality of an 8-year-old while not being too cumbersome or uncomfortable. Jonny was clear with the students that he didn’t want a prosthetic, an appendage that would attach to his body. The final device is about the same length as a child’s arm and includes a clamp that attaches to the bike’s handlebars, a flexible elbow piece, and a small cup, into which Jonny places his right arm. Inside the cup is some light padding for comfort. Although some early models of the arm device broke, the students eventually found a combination of metal and plastic that was sturdy enough to hold up to the vitality of an 8-year-old while not being too cumbersome or uncomfortable. Photo by Kirk Murray. After a year of work, the students met with Jonny during the week of April 24 to make final adjustments to the device and to practice riding the bike one last time. As the students watched Jonny happily pedaling around a small park on campus—a gleeful grin stretching across his face— they commented on his newfound ease. Although he still uses training wheels, Jonny’s control of the bike is much better than it was when the design process started. And those tight turns? They’re not such a big deal anymore. 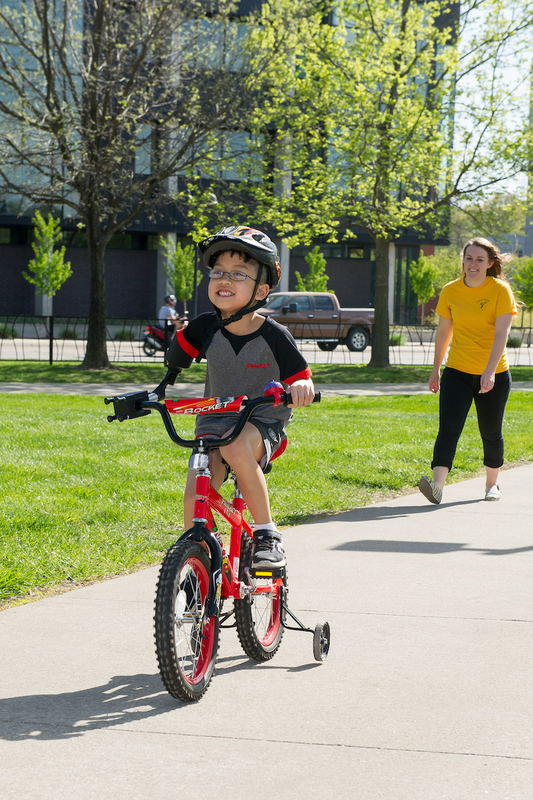 “When I ride my bike, I feel more stable and it’s easier,” says Jonny, who wants to demonstrate the device and introduce his new buddies to his teacher and classmates before the end of the school year. On April 28, Hershberger and her teammates presented the device to a panel of judges at the Biomedical Engineering Design Day at the Iowa Memorial Union. They say there was a hint of melancholy as the project’s finale neared. Though the students say they’re happy with the finished device—the design for which they plan to make available to other amputees—they admit they’d miss Mondays with Jonny. As for Jonny’s dad, he says he couldn’t be more proud of his son or more pleased with the work of the biomedical engineering students.